This page is for the original version. 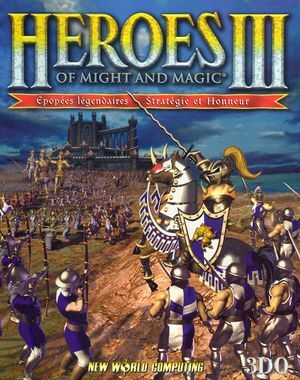 For the remake, see Heroes of Might and Magic III HD. The Mac OS and Linux versions of the game are no longer sold, and existing copies of those are hard to run on modern systems. The easiest solution for running the game on Linux or OS X is buying the Windows version and running it under Wine. Further information on how to do that can be found on AppDB. Alternatively, VCMI can be used to run the game. On Mac OS only available in Complete Edition. Higher resolutions along with 32-bit color support and more fixes. An unofficial expansion pack adding further units, resources and easier modding possibilities. The official English website is located under Celestial Heavens. Currently isn't in development any more. Another unofficial expansion pack adding more features, units, resources and another town. The official thread on Heroes Community. Not actually a mod, but an attempt at rewriting the whole engine to make it customizable, portable and fully cross-platform. The official website of the project is here. 800x600 only; use Heroes3HD for resolutions up to 4000x4000. Desktop must be in 16-bit colour mode (press F4) or use the Heroes3HD mod. Official localization by «Buka Entertainment». Retail and GOG-version. This is caused by a bug in the game, experienced only on multi-core or hyper-threaded processors. Newer GOG.com versions do not have this issue. It can also be resolved by using the HD mod. Another means of fixing sound can be found here. Set the CPU affinity for the game process to one processor. This needs to be repeated every time when running the game. This page was last edited on 24 April 2019, at 12:37.